Christmas time is a great excuse to get dressed up in something fancy. Here’s some very special outfits that babies and children can wear to Christmas lunch and then for special occasions through the year. First up, for baby girls is this adorable singlet and bloomer set from Bonidee. The pure cotton floral print is perfect for hot summer’s days, and with the smocked bodice and ruffle on the bottom, it is cute to boot. Priced at $45, it is available from Bonidee. There is a dress and bloomers version for older girls. 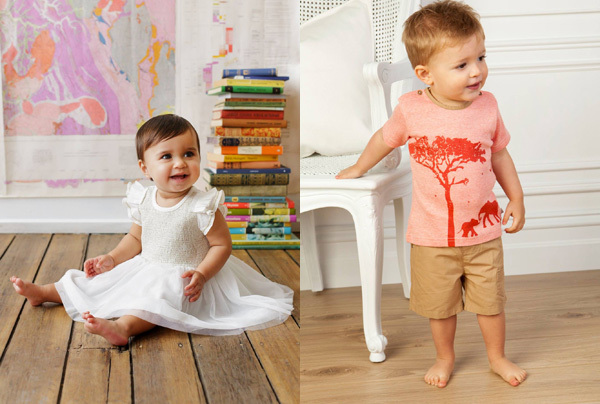 For babies, Melbourne brand Wilson & Frenchy have plenty of pure cotton onesies, playsuits, shorts and tees that are fancy enough for special occasions, but comfy enough that babies will happily wear them all day. They look good too. 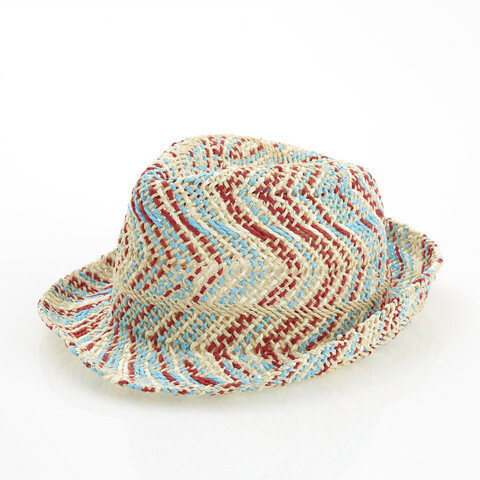 Find them in unisex designs as well as designs to suit boys or girls over at Wilson & Frenchy, priced from $22.95. If you need something special for baby, Fox and Finch and its stablemate label Bebe by Minihaha can always be relied upon to deliver the fashion goods. This stunning white smocked Fox and Finch tutu dress, Fifi, will make baby the belle of Christmas lunch. It costs $54.95 from Cupcakes and Cola. The Zane silhouette tee ($24.95) and Zane Mica pull-on chino shorts ($34.95) are from Bebe and can be purchased at Cheeki Brands. Fox and Finch are also the label behind the sweet blue and white Mon Petite Coeur dress ($54.95)and Helsinki shirt ($36.95) and Helsinki denim shorts ($36.95) pictured at the top of this post. Find them at David Jones stores nationally. Nothing says Christmas like a red dress, and this stunner from Australian children’s label Chalk N Cheese has all the festive frills and frippery you could possibly want. The Tulip Red Ice Skating Dress is made from washable linen and comes in sizes from 2 to 12. It costs $84.95 from Chalk N Cheese. And yes, it comes in pale pink too. It’s all going on for the boys too at Chalk N Cheese, with some decidedly hip shorts and shirts with that laid back style that’s quintessentially Australian. And you must check out the plain Timothy Tees in this collection. You’ll never – no, not ever – come across plain tees for boys in such a soft-to-the-touch cotton. 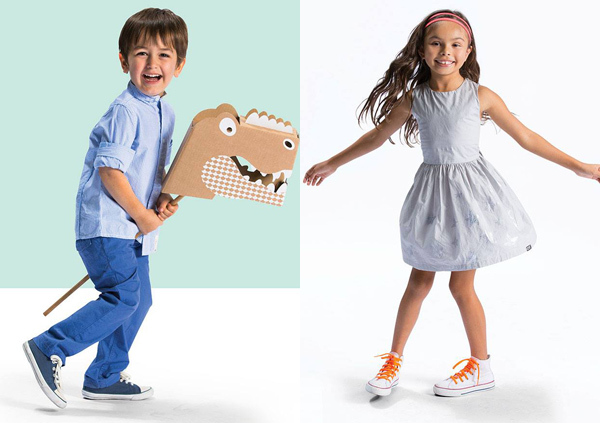 The Chalk N Cheese boys’ collection is priced from $34.95. 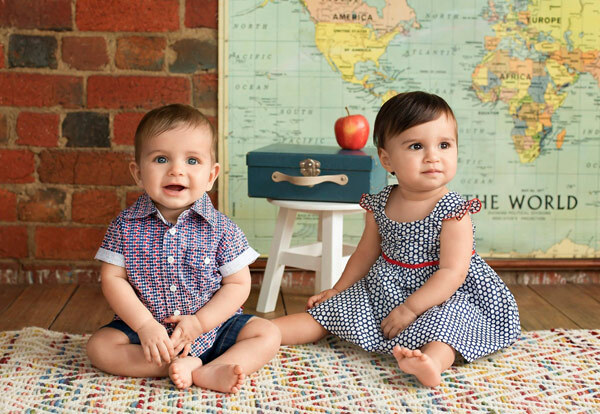 Another Australian favourite of ours, Eeni Meeni Miini Moh, has perfected the art of making clothes for kids that are dressy enough for special occasions, but with just the right splash of casual cool. There’s button down shirts and pants for boys a plenty, along with polos, tees and shorts if the Christmas forecast sways to hot. For the girls, this silvery Crossover dress (above right) is a festive winner at $99.95, and there’s plenty more dresses to choose from. Oobi have become a classic Australian brand, and their signature red prints are perfect for Christmas and beyond (so perfect, in fact, that Oobi have released a limited edition Christmas rosette to go with them!). 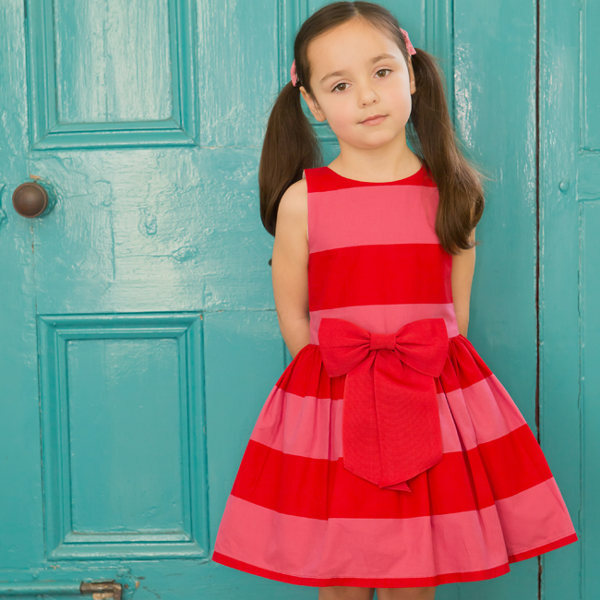 The Clementine scarlet and pink stripe dress is the pick of the bunch in my house of girls, with its removable bow and tulle underskirt to ensure ball gown style puff. It is available in sizes 2 to 6 for $59.95 from Oobi. 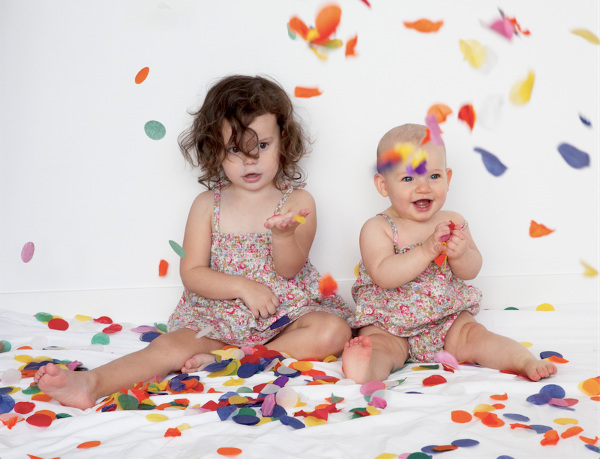 Rock Your Baby is another homegrown label serving up fab frocks for the girls. The Skandi Sleeveless Party Dress is perfect for both Christmas Day and for summertime parties. As an added advantage, the unique orange colour and retro print will have your little girls standing out in a sea of pink. Available in sizes 1 to 8 from Rock Your Baby. RYB also sell petticoats to wear under their dresses for added ‘stick-outie-ness’ should you have a child for whom such things are important! And to round up what has turned into a rather Australian collection of designers, we can’t forget Alphabet Soup for the boys. 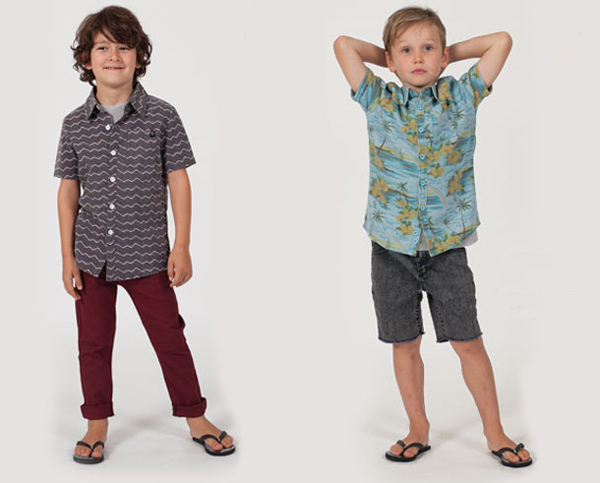 These guys make super-cool threads for boys and while the bulk of their collection is tees and casual gear, they also turn out some natty dressier threads for the boys. Check the New Wave shirt (above left) and Get Tropical shirt (above right), paired with Alphabet Soup’s After Dark shorts. They’re just the thing for boys who might otherwise baulk at getting dressed up. Contact Alphabet Soup to find a stockist of these street-smart outfits near you. Now that the outfits are sorted, let’s get onto accessories. 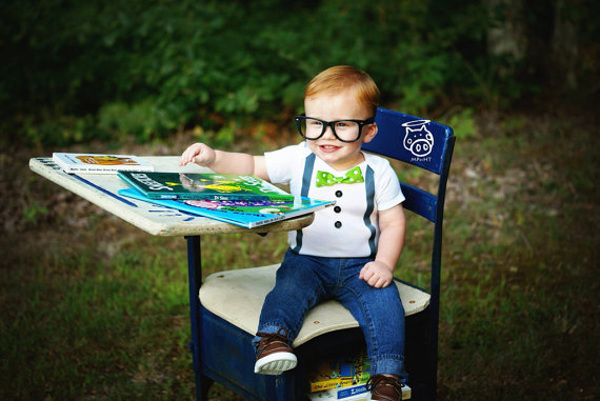 Those with little boys will just love the dapper goodies from Foxy Fellow. 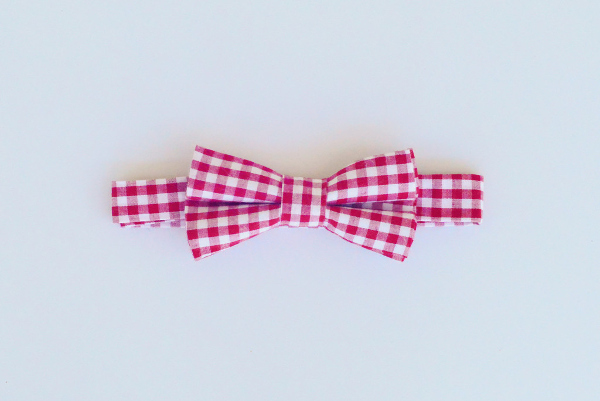 This smart bow-tie, the ‘Spencer’ is just $14 and will add pizzazz to your young man’s outfit. These sweet-as-pie baby moccasins from Little Bossy Boots come in an array of colours, including a very festive gold glitter. 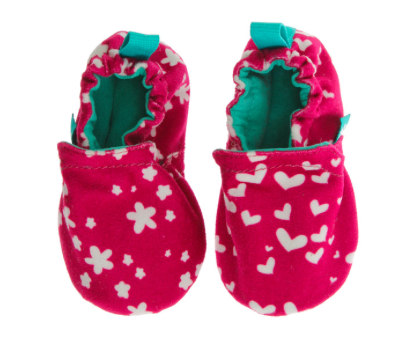 Made from super soft Italian leather, they are soft and comfortable for growing little feet. They come in sizes to fit babies from three to 24 months and retail at $40 from Little Bossy Boots. For the littlest members of your tribe, these baby shoes from Chooze Shoes are sure to be a hit this Christmas. When babies discover their feet, it is amazing how much time they can spend playing with them (who needs toys! ), and decking out their tiny tootsies in these gorgeous WeeChooze shoes will add another layer of interest. Made from pure cotton in co-ordinating prints, they are $39.95 from Chooze Shoes. If your family is planning an outdoor BBQ or picnic for Christmas Day celebrations, you need to consider sun safety as well as style. the weekend fedora hat from Hootkid will have your kids protected from the sun and looking as cool as the proverbial cucumber. They are $24.95 and available from Hootkid. I have to confess that I absolutely love baby bow-tie onesies, and if I had a boy he would wear them often. They are the right combination of comfortable and cool. Etsy store Drama Llama Llama have a great selection, and for just $15.50 you can afford to grab a couple to safeguard against the inevitable baby messes. Finally, what’s an Aussie Christmas Day without getting wet in the sunshine? 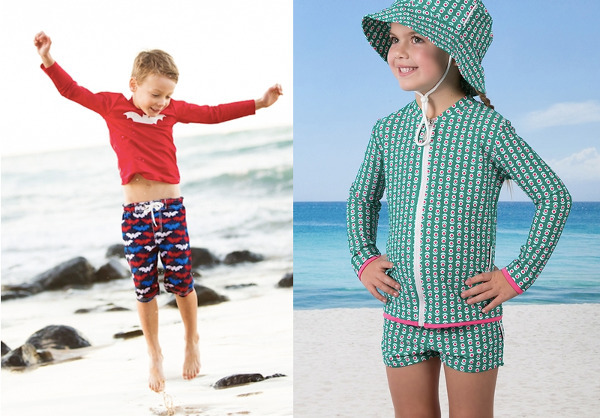 Whether it be the sprinkler or a pool, have your kids stylishly protected from the sun with Babes In the Shade swimwear. They have great long sleeved rash-shirts for boys and girls in sizes 1 to 12 for $44.